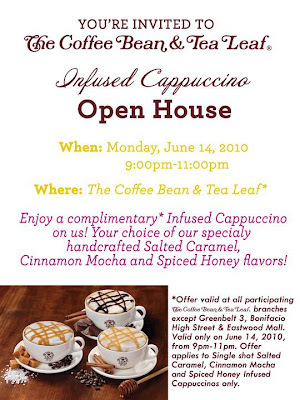 ruthdelacruz | Travel and Lifestyle Blog : The Coffee Bean and Tea Leaf Infused Cappuccino Open House! The Coffee Bean and Tea Leaf Infused Cappuccino Open House! I love The Coffee Bean and Tea Leaf for bringing the most innovative drinks! CBTL started that drink they call the Frappuccino (it is called the Ice Blended drink) and CBTL first offered tea lattes. Now CBTL is offering new drinks - Cappuccinos with a twist! Visit the Coffee Bean and Tea Leaf selected branches and be the first to taste the goods! Will absolutely visit the Techno Hub branch tonight! © ruthdelacruz | Travel and Lifestyle Blog : The Coffee Bean and Tea Leaf Infused Cappuccino Open House!